Sweet pineapple and shaved ham come together in one perfect grilled cheese! Hawaiian flavors are no longer only available in pizza form. Grilled cheese is a quick-and-easy lunch and dinner option. This twist on the classic is taking a little trip to Hawaii. 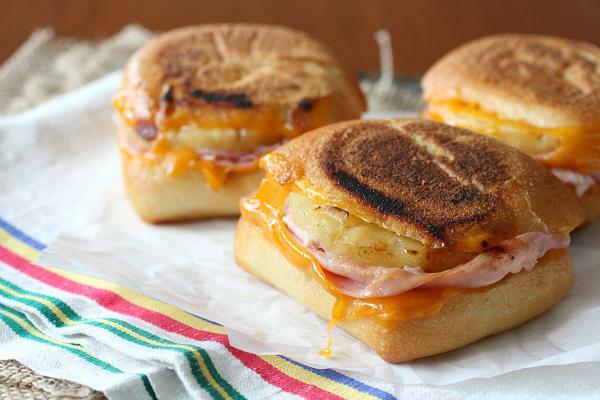 Sweet pineapple rings, smoked ham and sharp cheddar cheese are pressed together in perfect grilled bread. You won’t want just one of these sandwiches! Cut open rolls and start assembling your sandwiches: 1 slice of cheese, 2 slices of ham, 1 pineapple ring and top with another slice of cheese. Do this for all of your sandwiches. Butter the top and bottom of each bun. Heat a large skillet on medium-low heat and add in sandwiches. Cook till toasted and flip. Cook on the other side till toasted and brown. Serve immediately.